Bet you never knew that! Google founders Sergey Brin and Larry Page, after interviewing a dozen potential CEOs back in the earlier days, had thought of having Steve Jobs as their first CEO. The discovery comes from Bloomberg’s documentary series “Game Changers” which features the life stories of influential people from the technology, finance, politics “industry”. One such person is, of course, Steve Jobs himself who really needs no formal introduction to readers of Redmond Pie. After interviewing a dozen unsuitable candidates during Google’s early years, Page and Brin went to meet Jobs, a personal "hero" of theirs. The pair then asked investor John Doerr, "Why can’t he be our CEO?" Unfortunately, due to unknown circumstances, this never happened. Google eventually hired Eric Schmidt. 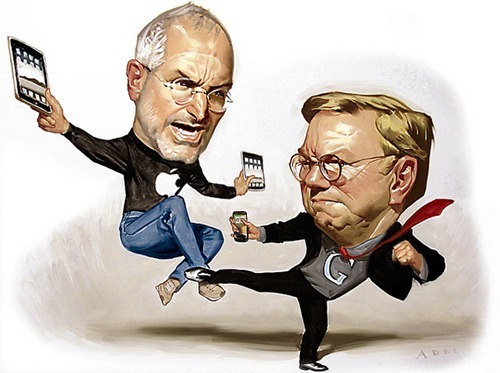 If Steve Jobs had been Google’s CEO, the Google we know today might just have been totally different. Would Google have moved formally into the hardware business? Would iOS have come from Google, and not Apple? Would Apple have survived had Jobs not returned in 1998? All valid questions!